McLaren will be one of the teams to beat this year after a poor 2006, says their former designer Adrian Newey. The Woking-based outfit failed to win a GP for the first time in a decade, but Red Bull technical director Newey warned: "They're a tough team. "In Fernando Alonso they have perhaps the most proven driver at the moment given Michael Schumacher's retirement." 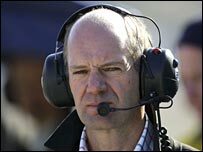 Newey also claimed F1's new rules on tyres and engine development have "fallen into their hands". McLaren have not won a grand prix since Newey left them at the end of 2005. With the Briton designing their cars, they won drivers' titles in 1998 and 1999 with Mika Hakkinen and the constructors' crown in 1998. Newey's cars also won four drivers' championships and five constructors' titles for Williams between 1991 and 1997. McLaren have signed Spaniard Alonso from champions Renault, with 22-year-old British rookie Lewis Hamilton driving their other car this season. Newey added: "I would imagine that they will be very competitive this year."